This morning as I was browsing the del.icio.us feeds that I subscribe to I came across an application that I’ve been playing with for most of today. It’s from one of my absolute favorite software vendors, VMware. 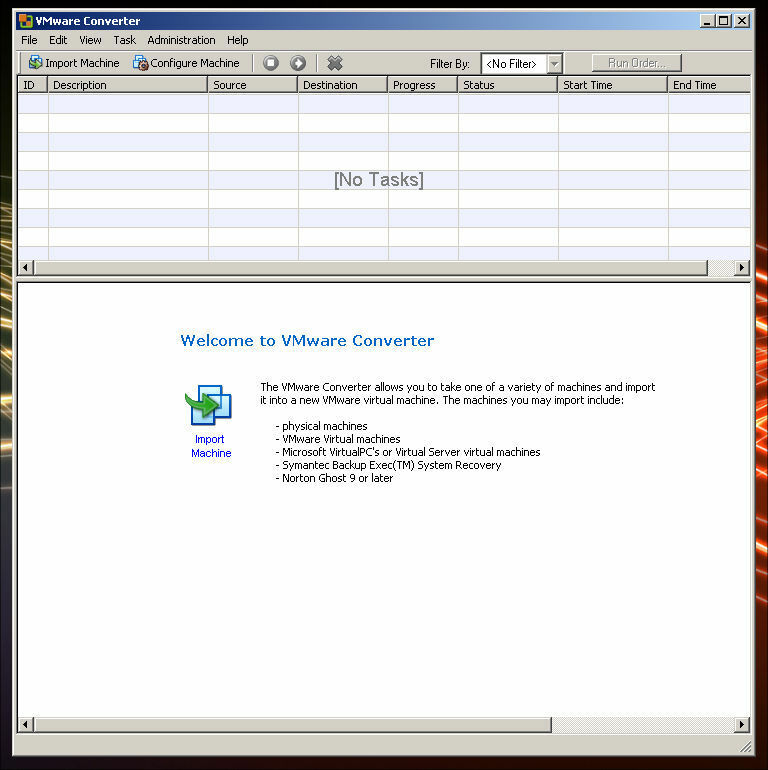 The software is called VMware Converter. I’m not sure how long it’s been out and I am really sorry that I missed this one if it’s been out for a while. Let’s say that you’ve got an aging computer or an aging server. You’ve also got a newer computer. You could take the old computer’s operating system and import it into a virtual machine. The virtual machine could then be run on your newer computer without taking up as many resources. You also get the added benefit of freeing up space. More importantly, you also save energy. Your newer computer may take a little bit more electricity to power the virtual machine but it’s not going to be near as much as having to power on another computer. In my experience you also make things quieter since older hardware tends to be noisier. Businesses have been flocking to virtual machines for all of the reasons mentioned above. It’s simply no longer cost effective to buy a new piece of hardware to simply run a piece of software. Businesses have also been using virtual machines for legacy applications. They take their old applications and put them into a virtual machine which frees up rack space and saves energy by getting rid of the dedicated box that was running the software. Another reason that someone might want to do this is if they were upgrading to a new computer and were going to get rid of the old one. They could import every file and setting on their current machine and access those files or settings through the virtual machine. People who are switching to Macs could use this to run Windows on their Mac, in theory. They could take the virtual machine of their old computer and run it in VMware Fusion (currently in Beta) or they could buy Parallels and convert the image type and run it on Parallels. I googled the problem and then I went to VMware’s discussion forum where someone suggested that the user that was running the application needed to be able to run as a service. I went into the Local Security Policy of the laptop and explicitly gave the Administrator account privileges to logon as a service. I rebooted the machine and I installed the VMware converter agent without a hitch. I then turned to my server and tried to import the laptop as a virtual machine. It continued to fail. I kept trying to find solutions to the problem but could not find anything. I then decided that I would install both the converter agent and the converter manager onto the laptop so that I could simply do an import of the local machine. I then kept getting the error message that I mentioned above. I looked around for solutions to the problem and then finally I decided to look in Windows Services to see if maybe I had a service disabled that the software was needing. Sure enough when I looked at the dependencies for the VMware Converter Service, the services it needed were not enabled. I enabled them and had the installer to keep retrying to start the VMware Converter Service. It would not so I went back into the Windows Services and tried starting the service manually. However, I kept getting an error message that said “Error 1053: the service did not start in a timely manner.” I thought, “OK, this is a slow machine. I’ll just try again.” Finally, about the fourth time the service started and I was able to install the software. I turned to my server again and tried to import the computer but it kept getting to 97% and failing. I turned to the laptop and tried to create a virtual machine on the laptop itself. VMware Converter on the laptop would also get to 97% and fail. Unfortunately, this problem has not been solved. I’ve submitted my problems to the VMware forum and hopefully someone will be able to suggest something or they’ll update the software. I was finally able to convert a physical machine to a virtual machine. I decided to try creating one of my server and it completed successfully. The process took about 20 minutes to complete. It will vary depending on how large your hard drive or partition is. A couple of things to note is that whenever I did this and started up the virtual machine, Windows said that there was a significant hardware change and that I would have to re-activate my copy of Windows and that I only had 3 days to do so. This means that after 3 days you’ll no longer have access to your Windows virtual machine. However, if you’re re-installing Windows and trying to get back up and running this will at least let you be able to get settings for your software or get your files. Just make sure when you create a virtual machine of your physical computer that you check all the drives you save files onto when it asks you which drives you want to be a part of the virtual machine. Make sure you’ll have room to actually create the virtual machine! Example: If you’ve got 20 gigs to back up, make sure you’ve got a 40 gig hard drive. Another thing that I had to adjust when I created a virtual machine of my physical machine was that I had to decrease the amount of RAM in the virtual machine. I have 1 gig of RAM in my physical machine and VMware was trying to give the virtual machine 700+ megabytes of RAM. I reduced this to 256. Also, once you get the virtual machine up and running, you’ll definitely want to get VMware Tools installed as quickly as possible. Otherwise, working with the virtual machine is unbearable. As far as I can tell, VMware Converter is freeware from VMware. They do have an Enterprise version that allows you to do simultaneous imports, export local and remote virtual machines and gives you the ability to clone a computer using a boot CD. For general purposes VMware Converter free edition is enough and I am truly appreciative of VMware for giving it away. Now that you have a virtualized copy of your physical computer how are you suppose to run it? There are several options available to you. The free options are to install one of VMware’s free virtualization products. Either VMware Player or VMware Server (which is what I use and prefer). With VMware Player you can “play” virtual machines but cannot create them. With VMware Server you can create virtual machines and run as many as your computer can handle. The title of this article may be shocking to some of you. You’re probably worried that I’ve became an Apple fanboy now that I have my very own iBook G3. The other day I was thinking about the iTunes Store and then today I saw this article written by Apple’s very own Steve Jobs. A long time ago I absolutely refused to purchase any music from the iTunes Store. Why? I would always fuss and complain that the music on there is full of DRM (digital rights management) and that you couldn’t do what you wanted with the music. Well, that is partly true. The music does have DRM on it but, really, it’s truly one of the most lenient DRM models out there. Why? First of all, you can play your music on up to 5 computers. If you get to the 5 computer limit you can now login to the iTunes store and de-authorize all of the computers and start over (you don’t have to ask anymore). I don’t have five computers to play music on but this is most certainly a welcome change. I also did not know until I read in the press release (the one Steve Jobs wrote) that your music can be played on any iPod. I guess that means you could put the music that you purchased onto anyone’s iPod. I don’t have an iPod, so I really don’t know about this but I assume it is correct since Mad Dog himself said it! Also, if you absolutely refuse to have the DRM on your music, you can burn the music to a CD and rip it back to your computer without the DRM. You can import the music in AAC or MP3 format. Out of being annoyed by the fact that the music I bought had DRM on it, I’d always do this. Lately, however, I’ve come to the conclusion that it’s a waste of my time. I would usually wind up burning a couple of tracks to a CD-R and then re-import the CD using something like Windows Media Player. I’d then have to tell Windows what the song was and if for some reason it couldn’t find the information in the online database I would have to manually enter the ID3 tags. This, truly, was a waste of my time. Don’t get me wrong, I think burning your music to a CD is a great feature. Especially if you’re wanting to play your music in a car stereo. I don’t have a car and don’t go places often so for me it was becoming a waste of time and a waste of a blank CD! If it wasn’t for the fact that iTunes purchases can be made using PayPal, I would not be making purchases on iTunes. I don’t have a credit card and I refuse to have one. I transfer money to my PayPal account and then I go into iTunes and go on a shopping spree (depending on how much I transferred!). My friend Steve Harris mentioned earlier when I was discussing this with him that it is a great idea for parents. They could give their kids an iTunes allowance via PayPal. They could also go to the store and buy an iTunes Store gift card and let their kids buy whatever they wanted on the iTunes Store. The iTunes’ podcast aggregator: I like it and it does work really well, but, there is one problem that I have with it. If I have to re-install my operating system, go to another account or use another computer, I lose my podcast subscriptions. I know you can export your subscriptions, but, I always forget. For a long time I’ve been using a service called PodNova to subscribe to all my podcasts. My list of subscriptions stays on their website and if any of the above happens, I can still access my list of podcast subscriptions without a lot of hassle. I haven’t done this, but, I could use their service and subscribe to the giant feed that they provide to you so you can plug it into any podcatcher and it will supposedly download all the latest enclosures, but, you don’t really get the same type of organization that I and many other people expect. I’ve just been using the PodNova client (based on Juice). I install the application, sign in and there are all of my subscriptions waiting for me. Think about this: if you have iTunes on your computer you more than likely have an account with Apple. I think Apple could do the same thing that PodNova is doing but make it even better. One way to make it better is if I go to another computer and open up iTunes, I could login and only the latest episodes that I have not listened to or watched would download instead of the last entry for every single subscription downloading. Another reason I am loving iTunes! After I finished writing this entry, I decided to go and have a look around on the iTunes store because I’ve been wanting to get some new music. I saw one of the coolest things. STAR TREK EPISODES! They don’t have Voyager (although I already have all the Voyager episodes), The Next Generation or Deep Space 9, YET! I hope they will soon! But, I’m very excited! They have The Original Series (TOS) and Enterprise.